The Dominican Republic is situated on the island of Hispaniola, that was discovered by Christopher Columbus in December 1492. The island was administered by Spain before 1801, when Toussaint Louverture abolished slavery on behalf of the French Republic. Shortly after France ruled the whole island until the Mulattoes and Africans rose up against France, won independence and proclaimed the state of Haiti. The second part of the island became the Dominican Republic, that was administered by France and later unified with Haiti. 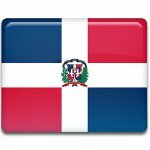 The Dominican Republic proclaimed independence from Haiti on February 27, 1844. On November 6, 1844 its first constitution was adopted. The anniversary of adoption of the first constitution (currently the republic uses the 38th constitution) is a public holiday. Until 2010 this holiday had been celebrated on November 6, but since 2011 it's moved to the closest Monday in order to provide a long weekend.